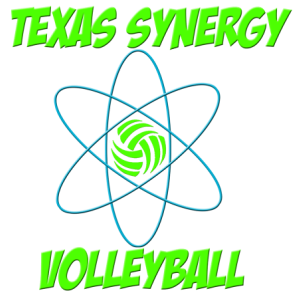 Texas Synergy Volleyball, inc. is a non profit program and was established to provide junior athletes and families a positive environment for training and club volleyball. We strive to give each athlete an opportunity to grow in technique, skill level, team work, and leadership in a positive and fun learning environment. Texas Synergy Volleyball training philosophy is to help players understand how and why they perform certain skills to maximize retention and execution of the skill and their understanding of the game. We are dedicated to helping our players reach their goals and potential and build quality teams that produce the essence of Texas Synergy Volleyball. We teach our players what it means to be a true athlete and team player. We stress the importance of team synergy and what it takes to create it. Our staff loves this sport and we are dedicated to helping grow Junior volleyball in Texas through passing on our love of the game, and maintaining an affordable volleyball program. We encourage our players to do the same, and give them opportunities to do so during our season through our junior programs . We are strong believers in work hard play hard and we want our athletes and parents to have fun and enjoy their season. We believe current day club prices are ridiculous, and we are proud to provide competitive tournament schedules, and more training than other area clubs at a drastically lower cost. We are not in junior athletics for the money, we are all about giving back to this amazing sport, and helping our athletes reach their goals while making their childhood safe, enjoyable and fun. We hope to blaze the trail to change the stigma on "club" volleyball, and be a model program for others to create and offer affordable club teams and training programs. Club has a wide range of playing levels, divisions, and costs. There is enough room for all, and a team and club that fits every young athletes commitment and interest level. Our Mission Statement: To immerse volleyball athletes of all skill levels into a positive teaching environment where members reach their potential and personal goals. All while learning what it takes to create team synergy that is committed, organized, and prepared to compete. And to be a leading club that helps in creating strong, confident, goal oriented young women both on and off the court. Our Slogan: "Practice with a PURPOSE, play with a PASSION...Texas Synergy Volleyball"
We are GROWING and currently looking for qualified coaches for the 2014-2015 Club Volleyball Season. We are seeking energetic and experienced coaches who enjoy passing on their love for the game. Our Master Coach Training system helps insure the consistent growth of both players and coaches through out the season. Our staff works close together to make sure every athlete in our program reach their goals and potential.